Freeport, NY: Books for Libraries Press, 1970. Hardcover. 8vo. Teal blue cloth with silver spine lettering. xviii, 408pp. Foldout frontispiece, illustrations, 2 foldout maps. Near fine. Faint age toning to endpapers. 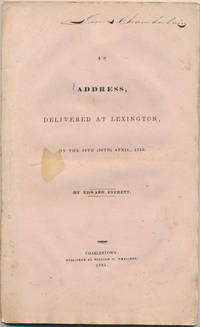 A tight and handsome facsimile reprint of the 1863 first edition. See BRADFORD 487, HOWES B 678 and SABIN 7150. New York: The Macmillan Company, 1971. Hardcover. Small 4to. Blue cloth with gilt spine lettering, pictorial dust jacket. xvi, 509pp. Illustrations, maps. Near fine/near fine. 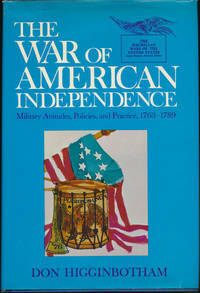 Wonderfully tight, attractive first edition of this volume in the esteemed "Macmillan Wars of the United States" series. By GORDON, General James A. New York: Frank Tousey, Publisher, 1907. Paperback. The February 20, 1907 edition (No. 455) of "Pluck and Luck: Complete Stories of Adventure." 4to. Pictorial color wrappers. 30pp, (2pp ads). Good plus. Outer wrappers a bit age toned and slightly edgeworn as usual; inner text pages moderately age toned and a bit delicate as usual. Attractive issue of this adventure weekly. Chromolithograph front wrapper shows a bluecoat-clad Continental soldier facing off against a group of charging redcoats on a dirt country road. Caption below reads: "'Back! back!' she cried; 'advance a step and I fire!' Little Lou kept backing all the time in the direction of the thicket. The astounded redcoats dared not fire, but kept following her up, wondering why a boy should thus hold them at bay." A far better than average dime novel (actually, "Price 5 Cents") or "penny dreadful," with text printed in two columns. Chicago: A.C. McClurg and Company, 1893. Hardcover. 12mo. Brown cloth with gilt spine lettering and blind-embossed front board. 292pp. Tissue-guarded frontispiece, 8 tissue-guarded called-for full-page plates. Near fine. A startlingly bright and fresh first edition of this quite early Lummis title. Very uncommon. The Genealogy of the Lamborn Family. With Extracts from History, Biographies, Anecdotes, Etc. Philadelphia: M.L. Marion, 1894. Hardcover. Small 4to. Grey cloth with black lettering. 487pp, (16pp). Tissue-guarded frontispiece, numerous full-page plates, maps, floral endpapers. Very good. Mild edgewear only. A tight and nice first edition of this extremely detailed Lamborn (or Lambourne) family genealogy, which hails back to medieval England. Ownership signature on inner flyleaf of one of those descendants, one Sarah E. Salander of Taylorville, Illinois, whose family appear in this volume; tipped on facing leaf is an envelope addressed to her (postal cancellation notes Philadelphia but no date, though the stamp affixed is the 1892 one-center celebrating the 400th anniversary of Columbus's landing), and contained therein is a tiny and elaborate early Valentine's card and two identical heavy stock printed invitations to an 1893 family reunion "of the descendants of Joseph and Rachel Ash," also Lamborn descendants. Quite scarce, as are most family genealogies of this period, printed in small quantities for family distribution and jealously guarded. Boston: L. Barta & Co, 1887. Hardcover. Small 4to. Brown cloth with gilt spine lettering. 246pp. Tissue-guarded frontispiece, numerous tissue-guarded full-page plates, floral endpapers. Very good. Mild binding edgewear. A tight, nice first edition of this in-depth family genealogy. Blank leaf following last text page bears a few pencilled notes, and tipped to inner flyleaf is an interesting 7 3/4" X 10½" document neatly penned by descendant Marie Thompson Perry (born 1842) showing her lineage back to Edward Converse in 1660 -- written in 1906 on behalf of her nephew Mackey James Thompson to support his acceptance into the Society of Colonial Wars (granted). Like most family genealogies, published in a small quantity for family distribution only and thus scarce. Charlestown: William W. Wheildon, 1835. Paperback. 8vo. Pale pink wrappers. 66pp. Mildly edgeworn, with occasional foxing; ownership signature on front wrapper. A tight, decent first edition of this typically long-winded speech celebrating the 60th anniversary of the 1775 battle by the Massachusetts politician and orator who had just completed ten years in Congress and would soon begin a single term as governor. SABIN 23246. This Revolutionary War patriot was a second lieutenant whose company participated in the Siege of Boston in the opening phase of the American Revolution. ADS, 1p, 7½" X 6", Boston, MA, 7 March 1793. Very good. A few minor archival reinforcements on verso. Large and boldly penned receipt for nails made out to "Luke Drury Esq / CoA of S. Smith Jr.," signed a second time (with "Received payment") at lower right huge and handsome, with attractive paraph beneath. Drury (1734-1811) was a noted Grafton, Massachusetts farmer, merchant, military and civic figure who served as a captain of militia, marching his minutemen to Concord and Lexington on April 19 to repel the British in 1775 and joining the fray at Bunker Hill on June 17; he took prominent part in the 1786-87 western Massachusetts farmers' tax revolt known as Shays' Rebellion; involved in local and state politics, he served as a state legislator and at various times as constable, deputy sheriff, assessor, tax collector and selectman. Apparently Smith dealt in hardware or dry goods as a merchant; interesting that a decade after the end of the American Revolution he should note Drury's position in his company on this civilian receipt! This charming colonial tavern or bar tab does not indicate place, but most likely was kept in or near Danvers, Massachusetts. AD (unsigned), 4pp (lettersheet), 4 3/4" X 7", n.p., January and February 1799. Very good. Lightly age toned, with a few inoffensive faint spots that are surely ale or grog or some such brew. Penned large and bold in a somewhat legible but scrawled barkeep's hand. First three pages are headed "January 1799" and the fourth leaf "February 1799." Each page simply lists a customer's name and below that the one or two drinks on their tab, often citing popular colonial-era drinks such as "flip" or "sling" no longer in use today (although recipes for these may easily be found online!). First page, for instance, records "Oliver Humbolt / to 1 Jill of Brandy" followed by price, while on the second leaf we see that Enoch Greenwood consumed "to 1 glass of sling / to 1 glass of Brandy / to 1 half mug of flip," and so on. Name spellings are quite phonetical; other names include Levey Thurston, Aaron Sharman, Ebenezer Cutler, Joseph Pritten, Samuel Harrington, Solomon Halden, John Rice, Artimay Ward (could this be Continental Army General Artemas Ward, 1727-1800? ), a couple others. Some of the entries bear a large inked "X" to the right, surely indicating the patron's tab was paid. Some of these names appear in the historical record (variant spellings) of Danvers and other surrounding towns in this area at this time. A delightful and fascinating relic of the young republic's drinking heritage -- and a rare survivor. Few of this type of document exist, there being little reason to preserve such temporary records. This pioneering Danvers, Massachusetts brickmaker joined the militia as a captain in 1773 and led a Danvers Alarm List Company into battle at Lexington on April 19, 1775; he supposedly took part in the Boston Tea Party, and his forbidding the drinking of tea in his house (his wife and her friends then went up on the roof to imbibe) inspired poet Lucy Larcom's poem "A Gambrel Roof." 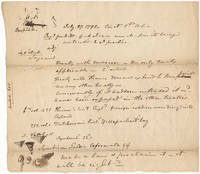 ADS, 1p, 7" X 2¼", Danvers, MA, 25 April 1760. Very good. Faintly age toned, with a bit of mild edge wear. 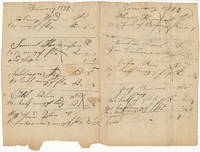 As constable, Page makes a formal written declaration of payment from one party to another: "Decd. of Mr. Saml. Holten £2.17.9 in full of David Putnam Jr. Decd. Rates for the year -- 1758." Holten (1738-1816) was a noted Danvers physician who served several terms in the Continental Congress and one as U.S. representative; there were several David Putnam Jr.'s in this area at this time, but if "Decd." after the name can be taken to mean "Deceased," this is likely the Danvers resident born 1717 and died February 3, 1760, this payment perhaps Holten's clearing a debt to Putnam's estate. This Revolutionary War patriot was a Massachusetts Minuteman who joined up in 1776 and rose to the rank of colonel; his home in Dighton, Massachusetts still stands. ADS, 1p, 7" X 4½", Dighton, MA,3 July 1798. Addressed to Thomas Lincon. Very good. Arranges a new time to meet and go cherry picking, for "I have sent down... & find that the Cheares are Not Ripe so we have Concluded to put of Doing till Next Wensday...." Boldly penned and attractive. This Declaration of Independence signer was a Maryland attorney and plantation owner; as delegate to the Continental Congress, he was a pacifist but nevertheless favored drafting the Declaration of Independence, and he also helped deaft the Articles of Confederation; he died at age 44 apparently of a broken heart just months after the premature death of his 36-year-old wife. ADS (within text), 1p, 15" X 9", Charles County, Maryland, 9 October 1779. Fair only. Quite edgeworn and delicate, with lightly age toned stock bearing dampstains, a bit of paper loss along one delicate fold line and small edge chips mainly along lower edge, partly obscuring Ferguson signature and a few other words. Lengthy and detailed boilerplate text entirely in Stone's hand, neatly and fairly legibly penned in brown ink and signed by him several times within the text. In this land deed, Stone purchases from Robert Ferguson for 124 pounds 14 shillings 4 pence "that Tract or parcell of Land called a Bridgets Delight lying and being in Charles County " followed by a detailed delocation description. Docket statement on verso likewise in Stone's hand and also with his signature within the text, signed at the close by two unknown officials; second docket on another verso panel in another hand. Despite rough condition as described above, a decent and interesting example of this quite scarce Signer's autograph. Having died at a rather early age, his autograph material is rarely encountered. This Revolutionary War patriot was a noted Massachusetts physician and statesman who served as Continental Congressman, a member of the state constitutional convention, many terms as state senator and from 1793-95 as U.S. representative. ADS (within text), 1p, 7 3/4" X 2¼", Danvers, MA, 24 June 1791. Very good. Faint age toning. "I have recd. of Dr. Holten, the Sum of two pounds 3/2d being the like Sum he recd. of the Treasurer of the Commonwealth, on my account, as a bounty on [ ? ]." Signed at the conclusion by Samuel Page (1753-1814), a Revolutionary War patriot and local ship owner and merchant who fought as a captain with the 8th Essex County Regiment in Battles of Bennington, Ticonderoga, Valley Forge, West Point, White Plains and Monmouth; he also served with Col. Topper's Regiment in the War of 1812. This noted Grafton, Massachusetts farmer, merchant, military and civic figure served as a captain of militia in the American Revolution, marching his minutemen to Concord and Lexington on April 19 to repel the British in 1775, joining the fray at Bunker Hill on June 17; he took prominent part in the 1786-87 western Massachusetts farmers' tax revolt known as Shays' Rebellion; involved in local and state politics, he served as a state legislator and at various times as constable, deputy sheriff, assessor, tax collector and selectman. ADS, 1p, 6" X 3½", Grafton, MA, 14 January 1799. Very good. Moderately age toned, with couple of edge tears expertlt and archivally closed on verso. 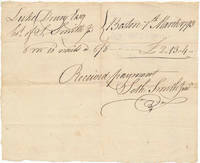 Promissory note to Lt. Joseph Bruce for $12, "which I promis to pay on demand, boldly signed with "Witness my Hand." Initialed postscript below notes that "the above is for Rum & [Bandages?] that Lt. Bruce advanced th Pay for me at Roxbury LD." Bruce could have been either (and most likely, since Drury notes his rank) the fellow officer in the Massachusetts Line of the Continental Army (1757-1849) or a local by the same name (1729-99) who lived in Grafton and died a few months after this document was signed. Interesting and unusual, in either case. Revolutionary War-era residents of Newtown in Queens County, New York. DS, 1p, 7 3/4" X 11 3/4", Queens County, NY, 25 February 1774. Good. A bit delicate and edgeworn, with moderate age toning. Retained draft, likely entirely in the hand of Jacob Hallet, of an unspecified bond between the three Hallet brothers and James Way in the amount of "fifty Three pounds fifteen Shillings and Eight pence...." Usual boilerplate legalese spells out "The Condition of this Obligation" and the terms under which it can be repaid. This bond might have been a lease for a tenement owned by Way in which the Hallets ran a cooper business; Henry Onderdonk Jr.'s 1865 "Queens County in Olden Times" records that on January 22, 1776, Way was advertising for rent the tenement in which Jacob Hallet lived. Other histories of this area such as the 1882 "History of Queens County" also note business dealings of the Hallets and of James Way (died 1788), a wealthy Quaker businessman whose ancestors were among the founders of Newtown in the mid-17th century. N.p. : N.p., n.y.. Single 4to leaf (pp. 225-26) housed in modern stiff blue 4to two-pocket folder with gilt front wrapper lettering. Fine. 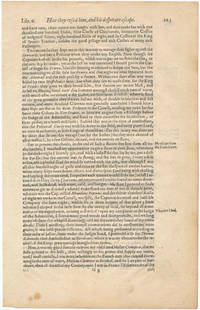 Just a single leaf of the famed first edition (London: Michael Sparkes, 1624) of the best-known work by the noted English soldier and explorer who led the Virginia Colony, helped establish Jamestown, gave "New England" its name and other distinctions -- as well as recipient of Pocahontas's largesse in 1607 --but a handsome example with no edge tears whatsoever and just the faintest age toned edges. Modern editions and facsimile reprints abound, but if you yearn to own a first edition of this nearly 400-year-old classic yet don't want to foot the low six-digit price tag that fine firsts have attained in recent years, this is a lovely alternative if you're willing to settle for just a wee bit of that first edition. Right inner pocket houses the original leaf while left pocket houses title page facsimile and page of history about Smith and this book. Printed colophon statement notes this a "Limited Edition of 200," this copy numbered 60. Who published this cryptic keepsake edition and when is not known, but it's clearly of fairly recent origin. In May 1793 a captured British ship was brought into the port of Philadelphia by the French privateer "Citizen Genet" and one of its seamen, who'd commanded the brigantine "Griffin" in the American Revolution, was arrested for violating the U.S.'s "Neutrality Proclamation" that sought to keep the young nation out of the conflict between France and Great Britain. It became a cause célèbre, with U.S. Attorney General Edmund Randolph personally taking part in the prosecution. It was an important test case, with Thomas Jefferson and Alexander Hamilton weighing in. It was the first time an American citizen was prosecuted for aiding the French, and Jefferson assured French Minister Genet that Henfield would be tried "by a jury of his countrymen in the presence of Judges of learning and integrity." On July 17, 1793 a grand jury indictment was obtained and in the trial soon after Henfield was found not guilty on all counts. 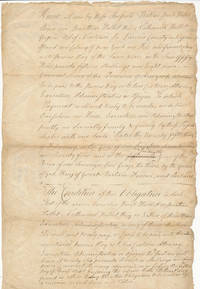 Unsigned Document, 1p, 7 3/4" X 7", n.p. [Philadelphia, Pa], 27 July 1793. Very good. This exceptional document, legibly penned in brown ink in an unknown hand -- clearly contemporary notes made on that day, quite possibly by one of the jurors. A bit fragmentary, with challenging abbreviations. After citing date, "Circt. Ct. U.S." and "Ingl. [Jared Ingersoll] fro deft. [defendant]," a more legible central portion notes "4. o'clock Sergeant" -- likely a closing summation by one of Henfield's defense attorney Joseph Dickinson Sergeant, the other two being Ingersoll and Peter S. Duponceau, as prosecuting attorney William Rawle had made his closing argument the day before. Here it notes, in part: "Treaty with Morocco is the only treaty applicable.... Treaty with France does not extend to this point nor any other treaty -- consequently if it had been intended it wd. have been expressed in the other treaties.... Hume's hist. [ory of] Engld. foreign soldiers crowding into England.... Hutchinson's hist. of Massachusetts bay.... make a law & proclaim in -- it will be right." Interestingly, in lower left corner the unknown writer pens a few interesting detailed doodles of unidentified objects, though one is clearly a hand reaching out for a couple of cups (one pictures this tired juror near the end of a grand jury looking forward to a spot o' ale at a local tavern). On the document's verso, he pens "Jury" and below lists twelve male names -- information we find recorded nowhere in the various accounts of this trial. This fascinating if somewhat cryptic document represents contemporary, on-the-spot reporting of one of the most important and controversial trials of the day -- one that established long-time maritime principles. Newly discovered, this fascinating document has never been studied by maritime historians and certainly warrants further research.